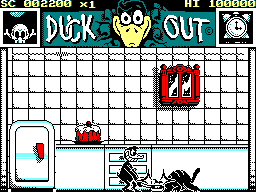 In this arcade game, you take control of a rebellious duck who has decided not to become someone's dinner and instead fights for its freedom using a frying pan! 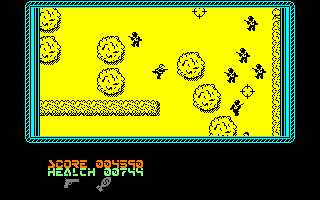 It is a humorous game which has its roots on the ZX Spectrum. 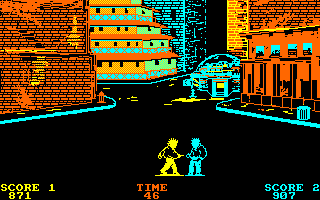 The graphics are Spectrum-like, but they look cartoonish and funny. They are also well drawn, but the speed of the game won't let you have a careful look. Everything moves very fast; even the tune is fast-paced. It is a very difficult game that constantly demands the player's best reflexes. Most probably, you will lose a lot of times before being able to progress. The grab factor depends on one's patience; will you find its difficulty to be a challenge or an annoyance? 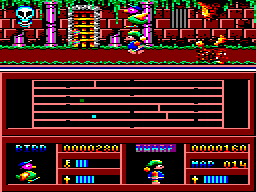 This game first appeared on an Amstrad Action covertape and was later released on one of Gremlin Graphics' own compilations, but it was never released on its own for the CPC. Anyway, it's basically an obstacle course where you drive a buggy down some ducts, avoiding the enemies and obstacles in your way, while collecting extra fuel and energy – you'll need them. 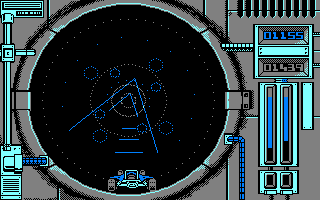 You can move along the walls of the duct, which sends all the objects (and your eyes) into a frenzied spin. The 3D graphics are excellent, yet the game moves reasonably fast, and there are some good sound effects too. It's a shame that it's too hard – reaching the end of the first level is very difficult – and you only have one life as well. 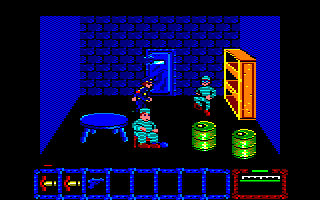 Coktel Vision were better known for their graphic adventures than for arcade games, and for good reasons. This happens to be one of their arcade games, and it's a beat-'em-up featuring three types of combat; karate fighting, street fighting between two punks, and two robots fighting each other – combat in the year 2000, supposedly. There are three skill levels, and you can play either against the computer or another player. Aside from that, there's little else to the game; no opponents of increasing skill, no goals to attain. The graphics are poor and the music that is played before and after each fight becomes really annoying. Save for the music, which is really good though maybe too invading, this game (which seems to have been released only as part of the 6 Pak compilation) is terrible. Your soldier moves as fast as a crippled turtle, and you must be exactly in front of your enemies to have a chance to kill them. 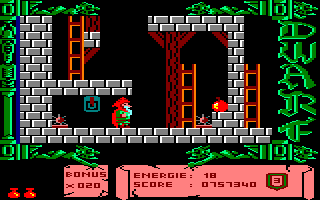 As in Gauntlet, you must find the exit of a level to go to the next one – and it is often surrounded by barbed wire, which you must cut. You have to replenish your health and ammo regularly, and you can use smoke bombs and grenades. It could have been a funny game but the controls are really too irritating, and the game is way too slow! This graphic adventure takes place before the events in Tír na nÓg. You control Cúchulainn the Great and you must find your faithful charioteer Loeg, who has been kidnapped by the sorceress Skar. Roaming through the streets of Dun Darach city, you'll encounter many people (among whom there are many thieves) who might help you to find Loeg. 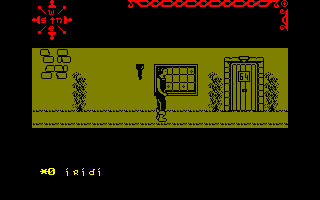 Dun Darach is a strange and complex game, with many puzzles to solve, and many shops and streets to explore. The graphics are good and detailed, but the sounds are reduced to an annoying beep. You can save and restore games, and you should, because it's too easy to be robbed of all your money, and money is essential in this game. Without that flaw, it would have been a really great game. See also: Tír na nÓg. The Demon Lord has fallen in the final part of the Middle Earth trilogy, but the danger is not over. If you want to reap the rewards of your hard work in the previous instalment, you'll need to raid the treasure-filled dungeons before your competition, including all sorts of creatures, beat you to it. Like its predecessors, Dungeon Adventure won't win many points for originality, but the execution is well done; strong descriptions and response times make slipping back into the world almost second nature. There is also a version available with graphics on the Jewels of Darkness compilation; the graphics add to the experience, but there is a very noticeable drop in speed, and there are also a few minor mapping differences. A good finale to the series but thanks to some slightly more creative approach to problem solving, it's perhaps a little less satisfying than the earlier games. See also: Adventure Quest, Colossal Adventure. This text adventure was created using GAC, and the author makes fun of the program a few times. In fact, he makes fun of the entire adventure scene in general, with some highly amusing room descriptions! Even the plot is reminiscent of a typical adventure; the kingdom has been plunged into chaos, and you've got to find an amethyst and give it to the alchemist – but you have to escape from the dungeon first. It's really easy to complete and is therefore suitable for beginners, but it's certainly not suitable for people who are offended by sexual innuendos – there are quite a few of them throughout the game. Dustin is confined in a maximum security prison, located on an island. This is no surprise, as he is a master at escaping from jail. Your first goal is to get outside the prison walls, then you'll have to make your way through the jungle to the beach, where you'll find a boat. Since the game is an arcade adventure, you'll have to make use of several objects. These can be obtained either by trading with other convicts or by knocking down the prison guards, although as soon as you attack any of them, things will get more complicated. Dustin has quite good graphics, average sound and well balanced gameplay. It's neither too difficult nor too easy to figure out what objects you need, and the arcade elements are quite enjoyable. Watch YouTube videos of this game by: jgonza, Metr81, Retro Danuart. You are a dwarf trapped in a set of dungeons, and must find a way out of each one by pulling a lever – but which one? Opening treasure chests reveals which direction the correct lever is to be found, but even then, you may need to use a little guesswork. Fortunately, the position of the correct levers in each dungeon is the same every time you play this rather mediocre platform game. While the graphics are lovely, the scrolling and animation are very jerky. Unusually for a platform game, there are no moving enemies, although there are plenty of other hazards which will deplete your energy or cause you to lose a life. Furthermore, jumping on to other platforms sometimes requires annoyingly precise positioning. Fans of platform games won't like this one. Dwarf and Duck are trapped in the Night House and must escape from it by finding ten pieces of a key that will unlock the door to the Calculation Room – although what is in there is a mystery to me. Dwarf and Duck can move independently or combine to form a single unit. Duck can fly fast, but Dwarf is the only one who can open the chests containing the keys. There are also one or more 'chasers' who move around the house and must be avoided, otherwise the game ends. Regrettably, this attempt at borrowing an innovative idea from another very well known game just doesn't work in practice. The graphics are delightful and the music is amazing, but the controls are awkward and the gameplay is dull. It's also advisable to change the difficulty settings once the game loads; the default settings make the game extremely difficult.